How to make fried ice cream without frying! 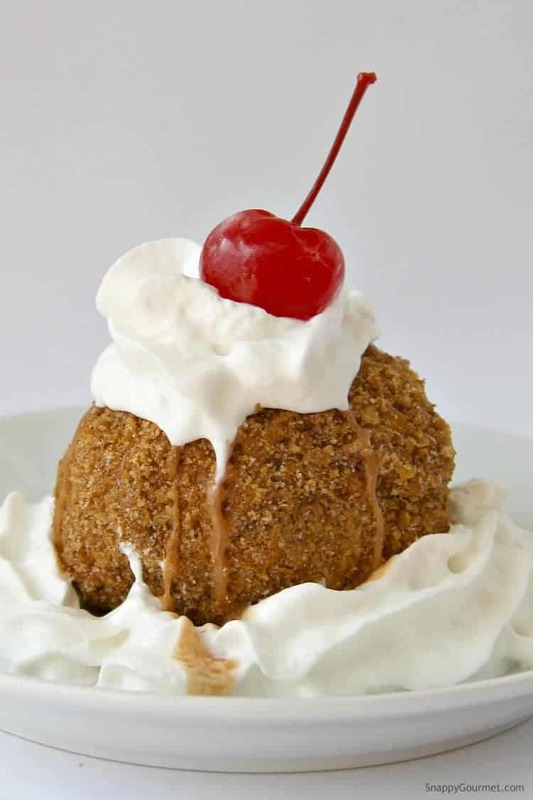 This easy Mexican fried ice cream dessert is great to make ahead for a party or dinner. If you remember Chi Chi’s fried ice cream, you’ll love this simple copycat easy fried ice cream version! Homemade fried ice cream in no time! How to make fried ice cream without frying! 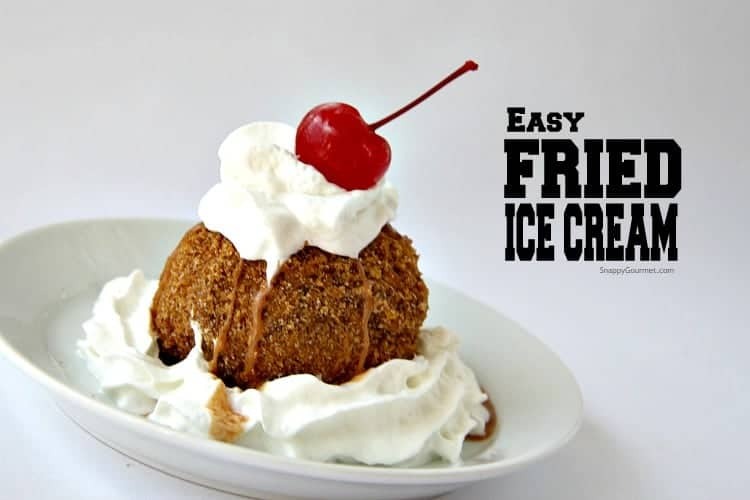 This easy Fried Ice Cream recipe, tastes like it’s been fried but it’s not. 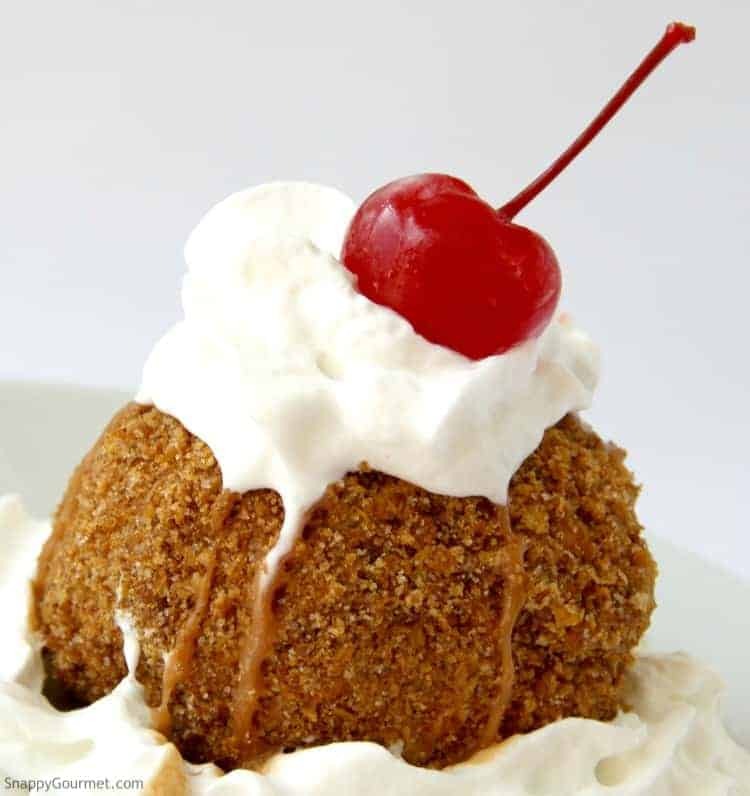 If you remember Chi Chi’s or have been to a Mexican restaurant you may be familiar with this Mexican fried ice cream dessert. If not, you’re in for a real treat! This homemade fried ice cream is so simple even the kids could make it! If you have never had Fried Ice Cream, you’re really missing out, and I do mean REALLY missing out! I should probably start off by saying I LOVE ice cream. It’s probably my biggest weakness. And Cinco de Mayo is coming up, so perfect excuse for this recipe!!! 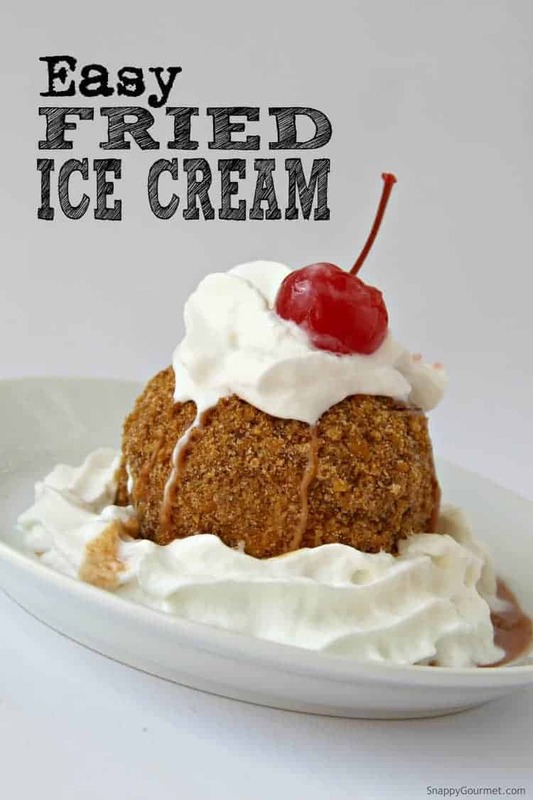 What is Fried Ice Cream? 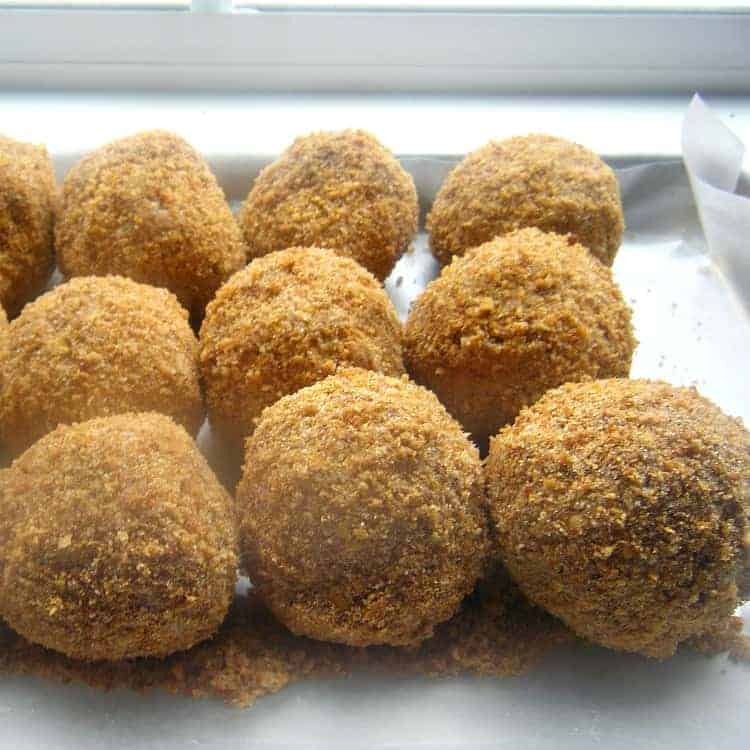 There are many versions of fried ice cream. Some are fried and some are not. 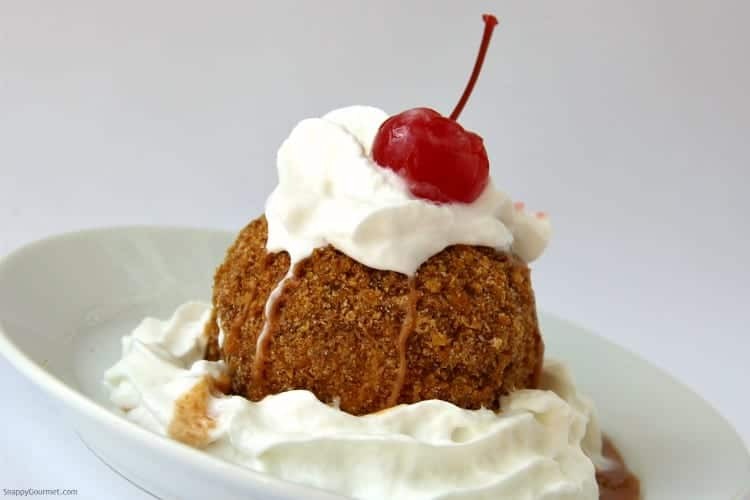 You’ll generally see fried ice cream at Mexican restaurants although some Asian and Thai restaurants also have a version. Some versions have you wrap a ball of ice cream in bread or dough and deep fry it. Then it may be topped with honey or ice cream sauces (like hot fudge, caramel, strawberry sauce, or even my homemade peanut butter sauce for ice cream), whipped cream, and/or cherries. Unfortunately, we don’t have many Mexican restaurants around here. I used to LOVE Chi Chi’s fried ice cream growing up (remember that restaurant?). I wanted to come up with an easy fried ice cream I could enjoy at home. I’ve had to make my own Mexican food which has been fun, but I still miss my Mexican restaurants with fried ice cream! This fried ice cream with corn flakes might not be completely “authentic” but it’s easy and delicious. 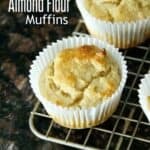 You can even make it gluten free! 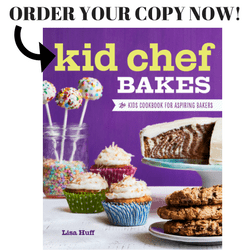 Just make sure your brand of ice cream, corn flakes, and other ingredients are gluten free. How to Make Fried Ice Cream? As I mentioned above there are different versions of fried ice cream. This version requires no deep frying! Wouldn’t say it’s exactly healthy, but less oil and not as much of a mess. Next, place the corn flakes in a food processor and process until fine crumbs. If you don’t have a food processor you can place the corn flakes in sealable plastic bags and crush the corn flakes with a rolling pin or pan. A food processor works best in my opinion. 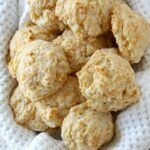 Place the crushed corn flakes in a large mixing bowl and mix in butter, sugar, and cinnamon. Pour the corn flake mixture onto a large baking sheet. Bake for about 10-15 minutes, and stir every few minutes so they don’t burn. Remove the corn flakes from the oven and cool COMPLETELY. Meanwhile, get out your favorite ice cream or frozen yogurt Any flavor or low fat version will work. We like vanilla or French vanilla, but other ice cream flavors like caramel, cinnamon, etc. would also taste great! Line a large baking sheet (or baking sheets) with silicone mats (or parchment paper or wax paper). Scoop the ice cream into balls and place on the baking sheets. 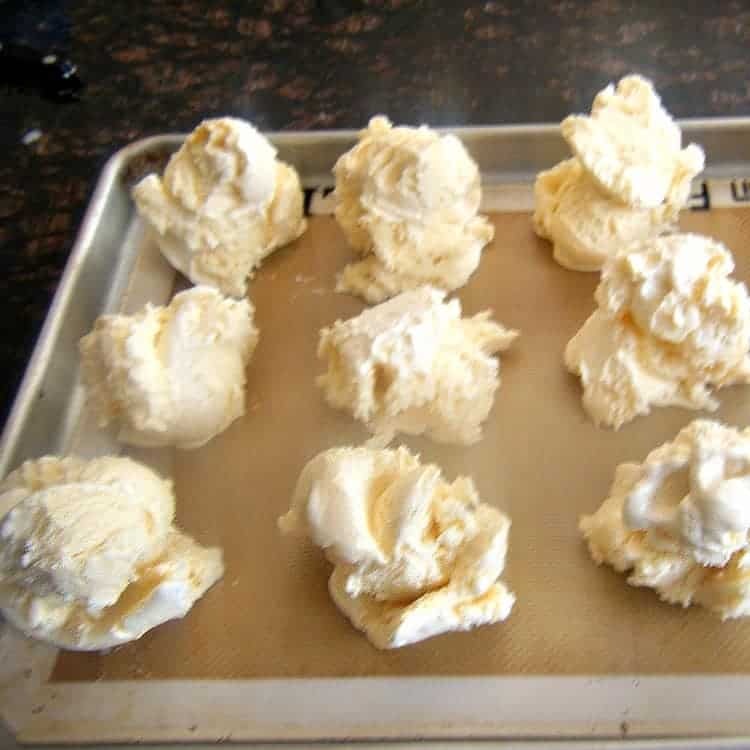 When you scoop the ice cream onto baking sheets, don’t worry if they’re not perfect balls. Just scoop the ice cream quickly and place in the freezer for awhile like 30 minutes or until hard. Work fast, because it melts quickly. You can make the ice cream balls into any size you’d like from very small to very big! A trigger ice cream scoop makes this is a lot easier. When the ice cream is hard, remove the balls from the freezer in batches. Quickly roll the ice cream into better balls with your hands (I like to use disposable plastic gloves), and then roll the ice cream in the cooled crushed corn flakes. Place the fried ice cream balls back on the baking sheets and very quickly get them back in the freezer. Work fast and in batches because the ice cream will melt fast! 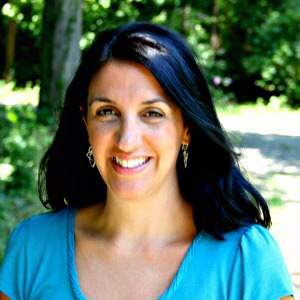 If you have kids or someone who can help you, that works well. Freeze the fried ice cream balls for another 30 minutes or until hard or ready to serve. They will keep in the freezer for a long time. If you are going to keep them for later, I’d suggest once they are firm, placing them in a sealable airtight container. 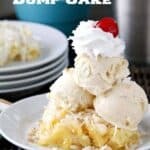 Serve this Mexican Fried Ice Cream dessert with all your favorite sundae toppings and you have one yummy treat! A perfect easy fried ice cream and make-ahead dessert! 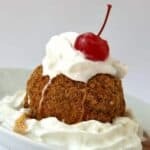 This easy fried ice cream recipe makes a lot of ice cream balls, but you could easily cut the recipe in half or less. The cereal mixture keeps well in the freezer. I usually just make a big batch of the cereal mixture, keep it in a large sealable bag in the freezer, then buy some ice cream whenever I want to make Fried Ice Cream and put the leftover cereal back in the freezer. 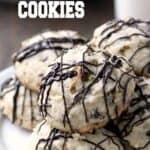 This recipe works great for a party! Set-up a “Fried” Ice Cream Bar with all your favorite toppings. Have a wide variety of different sauces (Caramel or check out my recipe for Cajeta (Mexican caramel), Hot Fudge, Strawberry Sauce, Honey, Maple Syrup, etc, whip cream, and/or cherries. 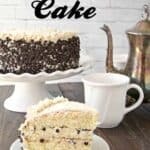 This dessert is always a favorite for my friends and family! Works great for Cinco de Mayo and summer BBQs. Check out the quick Fried Ice Cream video in the recipe card below to see how quick it comes together. Hope you now know how to make fried ice cream without frying! This Mexican fried ice cream dessert is such a fun party dessert. "Fried" ice cream with no frying involved. Just like what they serve in some Mexican restaurants. Place cereal in a food processor and process until finely crushed (or place cereal in batches in sealable plastic bags and crush with rolling pin or pan). Place crushed cereal in a large mixing bowl and mix in butter. Stir in sugar and cinnamon until well blended. Place cereal mixture on baking sheet(s) in thin layer and bake at 425 degrees F for 10-15 minutes or until golden brown, stirring after every 3-5 minutes. Remove from oven and cool completely. Line some baking sheets or plates with wax paper (or parchment paper). Make about 36 (1/2 cup) or 18 (1 cup) scoops of ice cream and place on baking sheets. 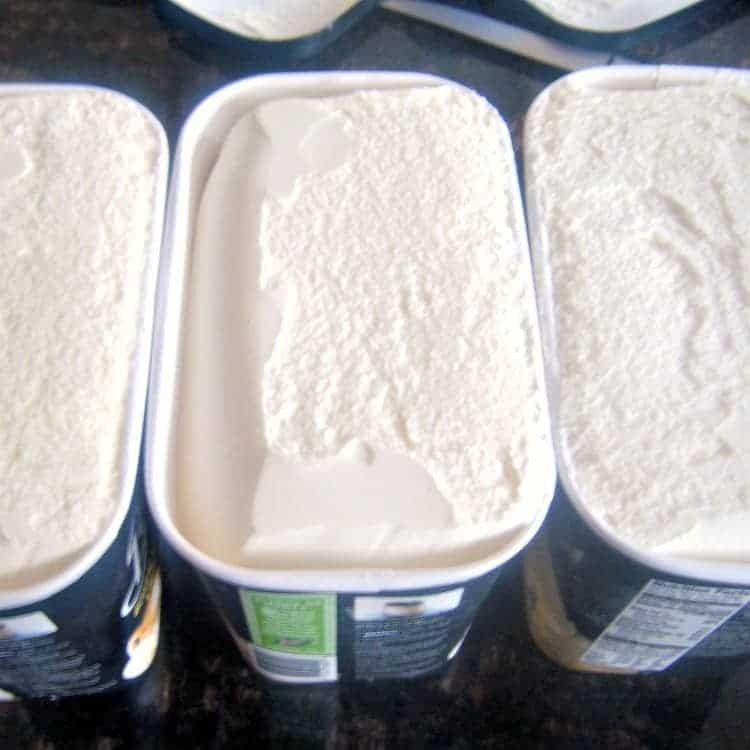 Don’t worry if they’re not round scoops, just divide out the ice cream and get the scoops back in the freezer fast! Freeze about 30 minutes or until hard. Working in batches (leave some of the ice cream scoops in the freezer so that it doesn’t melt), roll ice cream into balls (I like to use disposable plastic gloves), roll in crushed cereal then put balls back in freezer. Freeze another 30 minutes or until hard or ready to serve. Serve with your favorite toppings. SNAPPY TIPS: Make sure the cereal mixture is completely cooled before rolling the ice cream in it. Work with the ice cream in batches and keep the rest in the freezer so that the ice cream doesn’t melt too much. SNAPPY SUBSTITUTIONS: Use any flavor of ice cream or use frozen yogurt or lowfat ice cream. You could also add other things to the cereal mixture such as chopped nuts, toasted coconut, other cereals, chocolate chips, sprinkles, etc. For a gluten free dessert make sure your brand of ice cream, corn flakes, and other ingredients are gluten free. I’ve never had fried ice cream before, but it looks scrumptious! I love that you don’t have to actually fry this one. What a wonderful idea for such a delicious and refreshing dessert! Perfect for summer brunch! Oh my gosh I need to try ASAP! This is delicious. Thanks for the recipe! I’ve had fried ice cream once in my life and it was so delicious! Love that your version does not require deep frying! 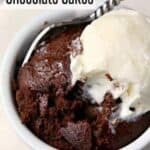 I need to try this recipe! I have a very similar fried ice cream pie, but I am loving how you served these! So much fun!! They are going on my Cinco de Mayo menu! Thanks! I’ve always wondered how you made fried ice cream. This would be so fun to make with my kids! Could you do this in a 9 x13 ? Then cut in squares ?